My new addiction is an old Russian fermented drink called kvass. It’s great as a breakfast juice or as an afternoon refreshment on a hot day: slightly sour, ice cold, a strong nose of beery grain or funky beet. it’s a drink for those of us who like deep, dark, barnyardy flavors. Or beer! As discussed in my Russian zakuski party post, kvass is a healthful tonic full of enzymes and the lactobacilli that are the new popular kids on the block. Whey can be added to rye bread or raw vegetables and fruits with nothing more than water, and the liquid will magically be soured to your taste. Like lacto-fermented pickles, kvass sits on the counter until the good bacteria multiply and give it a characteristic tang. I’m at work on my first blackberry kvass and a fermented version of tomato juice that I’m planning to push on an unsuspecting friend for bloody marys, and I will report back. Until then, I wanted to share some easy cold soup recipes using kvass as the base, since I’ve already gone on about it and I can’t get enough. Chop up two big red beets; add to a half-gallon jar with two teaspoons of salt and a 1/4 cup of whey, sauerkraut juice, or a similar fermented liquid to hasten fermentation. I used fermented dill pickle juice in the photo above, which is why you see a juniper berry floating on top. Fill jar 3/4 to top with water and stir. Let sit on the counter for 2-4 days, depending on how sour you’d like the mix. (I went for 4 days and the flavor was great for soup.) Skim off any mold bits daily. Strain and refrigerate. Drink as is, or use uncooked as a liquid for cold soups, correcting for salt. There are various names for soups like this in Russian and Polish, but let’s just keep it simple. You have two choices here: you can add your vegetables and let sit in the stock overnight for improved flavor but a thoroughly hot pink color; or you can add your vegetables just prior to serving for pretty colors (above). It’s, as they say, all good. To a quart of cold kvass, chop up and add some or all of the following: cooked beets of various hues, cucumbers, scallions, chives, dill weed, apples, hardboiled eggs. Serve immediately or let flavors develop in the refrigerator. (But if you decide to add eggs, place on top just before serving.) Taste and salt if necessary. A gamechanging addition, should you have it on hand, is a good slug of dill pickle juice. Or try kimchi juice? Optional garnish: more herbs, a dollop of sour cream. 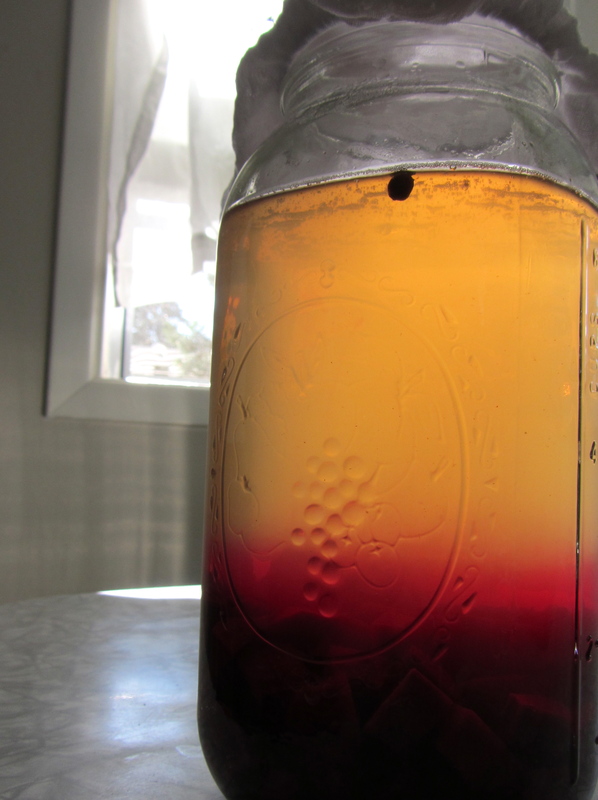 This recipe is slightly more complicated and gooey than beet kvass, and yields a mildly alcoholic brew. You’ll need to get your hands on decent rye bread, either light or dark, with no preservatives. Darker rye, such as the thinly sliced German or Russian stuff that’s bursting with grain and almost moist, is terrific but will yield a darker color for the kvass. In the picture, my kvass is a combination of about 1:3 dark:light rye. Alternatively, you can make your own rye or buckwheat mash, but I’ll leave it up to your powers of the internet to find a recipe for that. I’m going to play with yeast types (I’ve heard ale and champagne yeasts make better kvass) and did not bother to secondary-ferment my kvass, as I wanted it for soup and fizzy soup sounds kind of gross to me, so let me know if you have any advice. Dry bread in the following manner: (1) let it sit on your counter until hard; or (2) toast in the oven until hard and golden brown. If it burns a little, that’s ok, since it will add to the flavor. Place in half-gallon jar. Boil 7 cups of water and pour over bread in half-gallon jar. Cover and let sit overnight. Strain bread and press very gently to get as much liquid out as possible. Discard bread and pour liquid back into jar. Add yeast or sourdough or whey, lemon juice, honey, salt, and some raisins. Cover and let sit on the counter for 2-4 days, checking for bubbles (good) and skimming off any moldy bits (bad) daily. It should smell a little like beer once it gets going and look like the photo below. 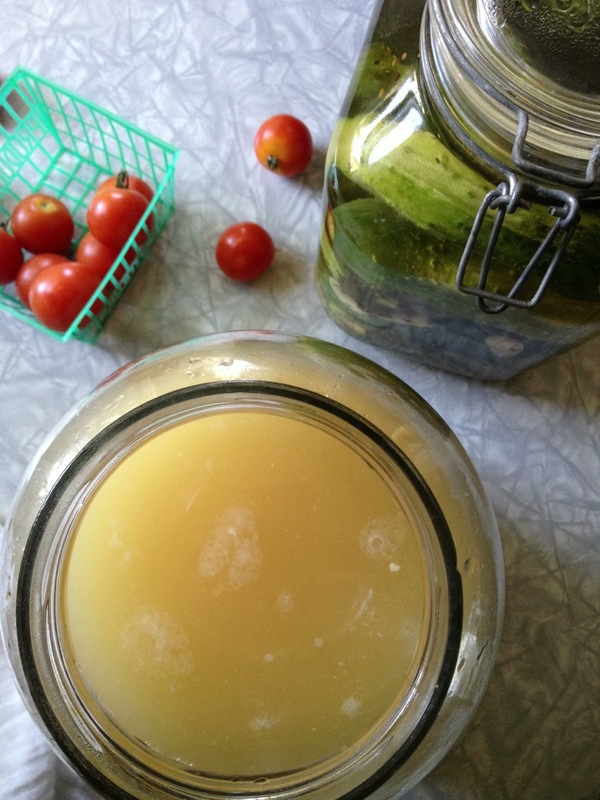 For secondary fermentation, strain the kvass through cheesecloth and pour into a 2-liter bottle. Add a few raisins to bottle. Seal the cap and let sit for a few days. Fermentation will build up inside the bottle. When the raisins float to the top, it will be done. Refrigerate and use as a drink sweetened with more honey, or as a delicious cold soup stock. Similar to the borscht recipe above, add chopped vegetables to a quart of cold rye kvass. Since this is a clear soup, don’t add beets or the color will be ruined. Season with a bit of and a healthy dose of dill pickle juice, whole grain mustard, salt, and parsley. There are as many versions of this soup as there are Russians. 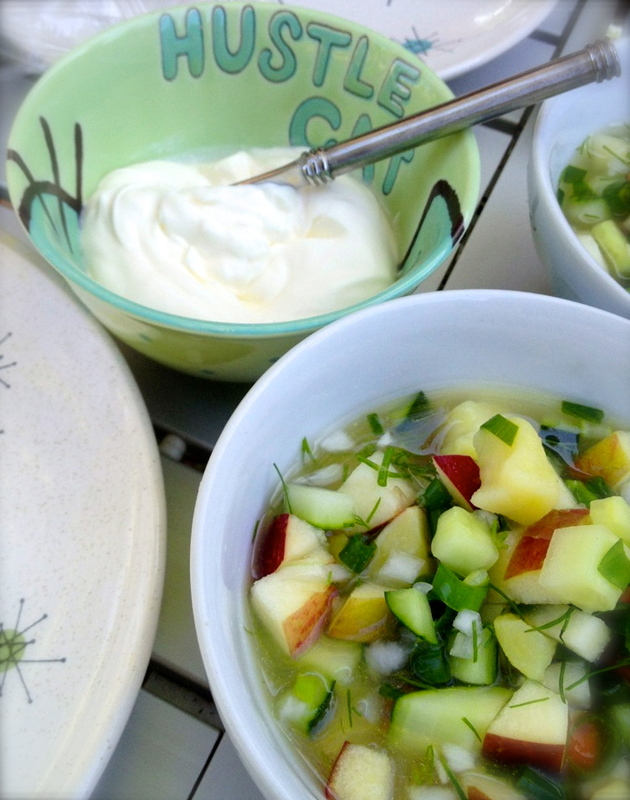 Sandor Katz offers a version with potatoes and turnips in addition to the apples and cucumbers, but I’m not sure I like the texture of potatoes in cold broth because they are softer than the crisp apples and tend to taste merely waterlogged to me. I might try a version that is only cold cooked veg, though: yellow or chioggia beets, tiny waxed potatoes, tiny turnips, steamed Dutch round carrots. Several recipes call for the addition of chopped fermented dill pickles, a brilliant touch if you ask me. In any case, the soup is even better with more dill and sour cream mixed in. Wash and peel melon, cut into chunks. Peel and seed cucumber only if using one of those grocery store kinds with leathery skin and big seeds. Tear bread into pieces and soak in kvass. Add to food processor bowl or blender melon, chunks of cucumber, kvass/bread, salt, peppers, tarragon, and shiso. Blend until as smooth as possible. You might try pressing through a food mill or chinois after this step, if you and your guests are fancy. Refrigerate for several hours, up to overnight but not more, to blend flavors. Serve with a dollop of crème fraîche and a chiffonade of shiso in each bowl. I’ve made countertop tomato pruno before (grate tomato; leave in ziploc bag on counter; when the bag is about to burst, it’s done) but never used it to make a bloody. So you bring tomato kvass, we’ll make up a batch of kimchi bloody mary mix (purée kimchi, press through chinois), and we’ll sit in the backyard and get housed and eat weird potato chips. It’s a deal! Breakfast of champions. I just need to find the right tomatoes. My yellow ones are unbelievably and deliciously acidic. It might be them. Oh these sounds magnificent. NOt sure why but this time of year I am so craving sour and salt. In a cold soup sounds so good! Yikes! I’m in Moscow at the moment and bought a two liter bottle of Kvass. Fortunately my Russian visitors love it because I find it “an acquired taste”, so I’ve been fobbing it off on them and they think I’m such a great host when in reality I’m trying to clear space in the fridge. Glad to hear it, Mary! Bruce Trackfan, I haven’t had the commercial kvass, but I hear tell it’s quite different from the light, sour homemade stuff. But very glad to hear you are considered a magnificant host. Would love to hear more about your Russia adventures. What a cornucopia of lovely recipes. I have some whey that I have been meaning to use up, so thank you so much for sharing all of these. I’m going to have a go at my own kwass too. 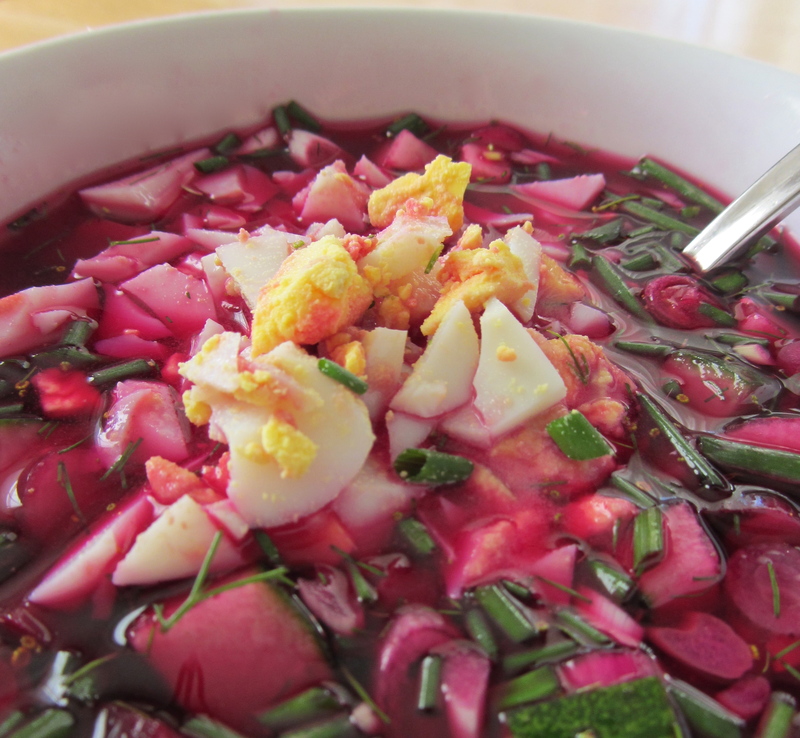 How interesting, using beet or rye kvass as a cold soup base! Beet kvass, unfortunately, always tastes rather like dirt to me. But I’ve got some beets and I’m going to try again to acquire the taste. 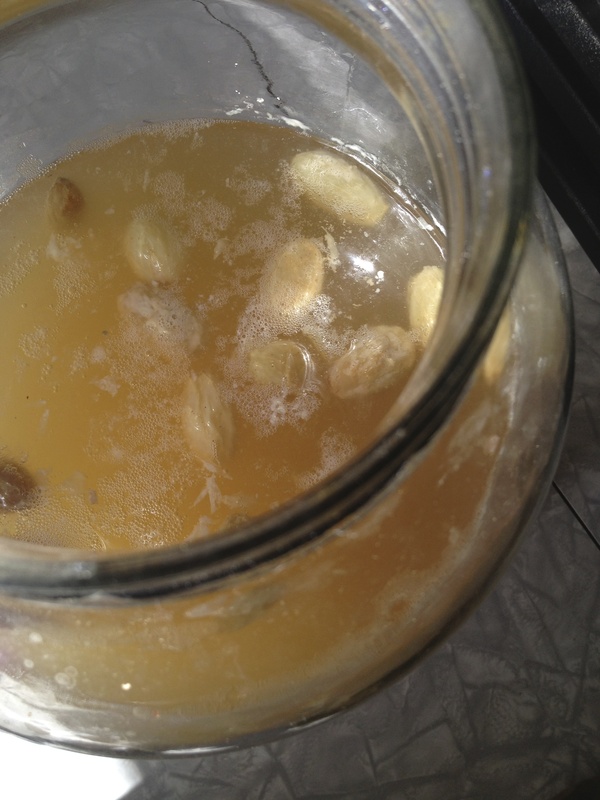 I’ve made rye kvass too, and much prefer it to store bought. My Belorussian sister in law said it was more like what they had as kids.